Carbon Capture and Storage Market size for 2016 was valued over USD 2.5 billion and the cumulative capacity is set to exceed 103 mtpa by 2024. Increasing demand for cost effective technology to reduce carbon emissions along with rapid industrialization will drive the global carbon capture and storage market size. The cost of mitigating carbon dioxide emission for coal power plant incorporated with CCS technology ranges from USD 23 – USD 92 per tons of CO2, whereas, for offshore wind ranges from USD 90/tons to USD 176/ tons and for solar thermal USD 139/tons to USD 201/tons. Stringent government regulation to curb greenhouse gas emission along with growing demand for clean energy will stimulate the carbon capture and storage market share. In 2015, under section 111 of clean air act, the U.S. Environmental Protection Agency introduced New Source Performance Standards to limit carbon dioxide emission from natural gas fired and coal fired power plant. According to this standard, the new coal power plant cannot emit over 1,400 lbs. CO2/MWh. Ability to reduce 85% to 90% of carbon emission over other alternates will make its adoption preferable over other alternates. Growing demand for CO2 EOR to enhance oil production will embellish the carbon capture and storage market size. Increasing number of mature fields along with large volume of non-recovered oil are some of the factors positively influencing the demand for CO2 EOR. High capital cost along with lack of government policies may act as industry restraint. Pre-combustion carbon capture and storage market size will exceed over 73 mtpa by 2024. The technology finds wide applications in integrated gasification combined cycle power plant. Ability of technology to convert solid fuel into syngas through heat application under high pressure in the presence of oxygen and steam will make its adoption preferable over other alternates. Ability to retrofit with existing and new build power plant will foster the post combustion carbon capture and storage market share. The technology is suitable for conventional pulverized coal fired power plants. In 2017, the U.S. introduced Petra Nova carbon capture which is retrofitted with 1.4 MTPA post combustion CO2 capture facility. 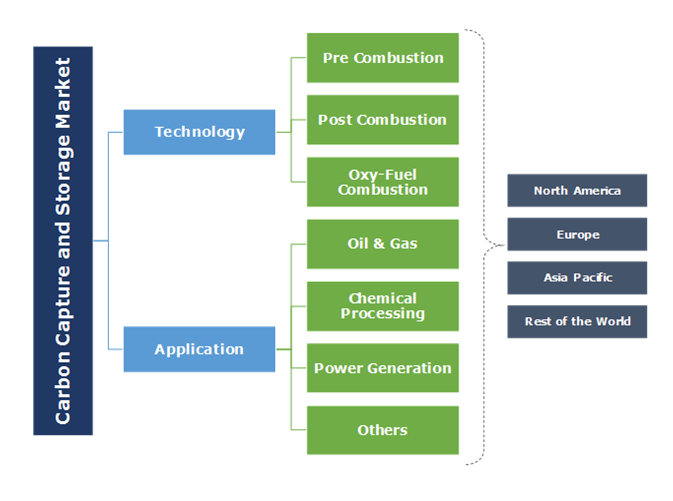 Oxyfuel combustion technology finds wide application in various industries including cement, steel, glass and incineration for production enhancement and fuel & NOx reduction. O&G industry applications in 2016 accounted for over 45% of global carbon capture and storage market share. Rising crude oil demand from downstream sector along with increasing investment towards upgradation and expansion of refinery facilities will propel the industry landscape. In 2017, Exxon Mobil announced to invest USD 20 billion to expand its refining and chemical plant by 2022. Growing demand for clean energy along with stringent government regulation to curb carbon emission will positively drive the power generation carbon capture and storage market. In 2008, UK government introduced Climate Change Act which aims to reduce GHG emission up to 80% by 2050 from 1990 level. In 2011, 2Co Energy announced to develop Don Valley Power Project, 900 MW IGCC power plant which came into operation by 2020. The U.S. carbon capture and storage market size is set to witness gain over 6% by 2024. Growing demand for clean technology along with introduction of government initiatives to encourage deployment of carbon emissions technologies will fuel the business growth. The U.S. introduced section 45Q with an aim to provide incentives for capturing carbon dioxide obtained from industrial and power sources which is further used for EOR. Increasing implementation of carbon dioxide enhanced oil recovery project will further complement the business outlook. Growing investments to encourage the adoption of sustainable energy will embellish the UAE carbon capture and storage market. In 2013, Masdar and ADNOC jointly awarded USD 122 million project to Dodsal group to build carbon dioxide compression facility which came into operation in 2016. The project has the ability to capture up to 800,000 tons of CO2 annually. Increasing implementation of coal and gas fired power plant to suffice electricity demand along with growing awareness to reduce carbon emission will propel the China carbon capture and storage market size. In 2016, China has around 200,000MW of coal fired power plant under construction with 150,000 MW of projects with potential to undergo construction. In 2017, China introduced Yanchang Integrated Carbon Capture and Storage Project, a coal to gas plant to capture 410,000 tons of carbon annually. Growing demand for cost efficient technologies to achieve decarbonization targets to reduce CO2 emission in 2050 by 80% from 1990 level will propel the UK carbon capture and storage market. In 2015, government of UK stated that CCS technology would save USD 38.69 billion to meet carbon emission target by 2050. Strong pipeline for CCS projects will positively impact the country industry growth. 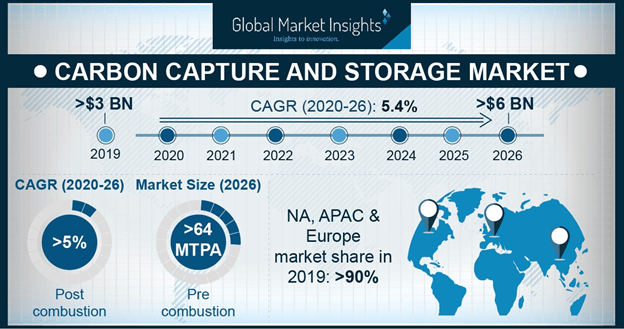 Key players in carbon capture and storage market include Aker Solution, Exxon Mobil, Fluor, Haliburton, Shell CANSOLV, Dakota Gasification, Linde Engineering, Siemens, Sulzer, Mitsubishi Heavy Industries, Japan CCS Company, General Electric, Schlumberger, and NRG energy. Significant investment towards research and development sector has been witnessed in the industry to make technology adoption more affordable. In 2015, the Government of Australia announced to invest USD 25 million in advancement of carbon capture and storage technologies. CCS is a technique that allows the transportation of carbon dioxide from pipeline or ship, capture of carbon dioxide from industrial process or fuel combustion and its underground storage in deep saline formation and depleted oil and gas field. It is used in various industries including power generation, oil and gas, chemical and agriculture to curb carbon emission. Its ability to reduce carbon emission from 85% to 90% makes its adoption preferable over other alternates.